State of Antarctica: red or blue? A couple of us (Eric and Mike) are co-authors on a paper coming out in Nature this week (Jan. 22, 09). We have already seen misleading interpretations of our results in the popular press and the blogosphere, and so we thought we would nip such speculation in the bud. The paper shows that Antarctica has been warming for the last 50 years, and that it has been warming especially in West Antarctica (see the figure). The results are based on a statistical blending of satellite data and temperature data from weather stations. The results don’t depend on the statistics alone. They are backed up by independent data from automatic weather stations, as shown in our paper as well as in updated work by Bromwich, Monaghan and others (see their AGU abstract, here), whose earlier work in JGR was taken as contradicting ours. There is also a paper in press in Climate Dynamics (Goosse et al.) that uses a GCM with data assimilation (and without the satellite data we use) and gets the same result. Furthermore, speculation that our results somehow simply reflect changes in the near-surface inversion is ruled out by completely independent results showing that significant warming in West Antarctica extends well into the troposphere. And finally, our results have already been validated by borehole thermometery — a completely independent method — at at least one site in West Antarctica (Barrett et al. report the same rate of warming as we do, but going back to 1930 rather than 1957; see the paper in press in GRL). 1) Our results do not contradict earlier studies suggesting that some regions of Antarctica have cooled. Why? Because those studies were based on shorter records (20-30 years, not 50 years) and because the cooling is limited to the East Antarctic. Our results show this too, as is readily apparent by comparing our results for the full 50 years (1957-2006) with those for 1969-2000 (the dates used in various previous studies), below. 2) Our results do not necessarily contradict the generally-accepted interpretation of recent East Antarctic cooling put forth by David Thompson (Colorado State) and Susan Solomon (NOAA Aeronomy Lab). In an important paper in Science, they presented evidence that this cooling trend is linked to an increasing trend in the strength of the circumpolar westerlies, and that this can be traced to changes in the stratosphere, mostly due to photochemical ozone losses. Substantial ozone losses did not occur until the late 1970s, and it is only after this period that significant cooling begins in East Antarctica. 3) Our paper — by itself — does not address whether Antarctica’s recent warming is part of a longer term trend. There is separate evidence from ice cores that Antarctica has been warming for most of the 20th century, but this is complicated by the strong influence of El Niño events in West Antarctica. In our own published work to date (Schneider and Steig, PNAS), we find that the 1940s [edit for clarity: the 1935-1945 decade] were the warmest decade of the 20th century in West Antarctica, due to an exceptionally large warming of the tropical Pacific at that time. So what do our results show? Essentially, that the big picture of Antarctic climate change in the latter part of the 20th century has been largely overlooked. It is well known that it has been warming on the Antarctic Peninsula, probably for the last 100 years (measurements begin at the sub-Antarctic Island of Orcadas in 1901 and show a nearly monotonic warming trend). And yes, East Antarctica cooled over the 1980s and 1990s (though not, in our results, at a statistically significant rate). But West Antarctica, which no one really has paid much attention to (as far as temperature changes are concerned), has been warming rapidly for at least the last 50 years. Why West Antarctica is warming is just beginning to be explored, but in our paper we argue that it basically has to do enhanced meridional flow — there is more warm air reaching West Antarctica from farther north (that is, from warmer, lower latitudes). In the parlance of statistical climatology, the “zonal wave 3 pattern” has increased (see Raphael, GRL 2004). Something that goes along with this change in atmospheric circulation is reduced sea ice in the region (while sea ice in Antarctica has been increasing on average, there have been significant declines off the West Antarctic coast for the last 25 years, and probably longer). And in fact this is self reinforcing (less sea ice, warmer water, rising air, lower pressure, enhanced storminess). The obvious question, of course, is whether those changes in circulation are themselves simply “natural variability” or whether they are forced — that is, resulting from changes in greenhouse gases. There will no doubt be a flurry of papers that follow ours, to address that very question. A recent paper in Nature Geosciences by Gillet et al. examined trends in temperatures in the both Antarctic and the Arctic, and concluded that “temperature changes in both … regions can be attributed to human activity.” Unfortunately our results weren’t available in time to be made use of in that paper. But we suspect it will be straightforward to do an update of that work that does incorporate our results, and we look forward to seeing that happen. Some comment is warranted on whether our results have bearing on the various model projections of future climate change. As we discuss in the paper, fully-coupled ocean-atmosphere models don’t tend to agree with one another very well in the Antarctic. They all show an overall warming trend, but they differ significantly in the spatial structure. As nicely summarized in a paper by Connolley and Bracegirdle in GRL, the models also vary greatly in their sea ice distributions, and this is clearly related to the temperature distributions. These differences aren’t necessarily because there is anything wrong with the model physics (though schemes for handling sea ice do vary quite a bit model to model, and certainly are better in some models than in others), but rather because small differences in the wind fields between models results in quite large differences in the sea ice and air temperature patterns. That means that a sensible projection of future Antarctic temperature change — at anything smaller than the continental scale — can only be based on looking at the mean and variation of ensemble runs, and/or the averages of many models. As it happens, the average of the 19 models in AR4 is similar to our results — showing significant warming in West Antarctica over the last several decades (see Connolley and Bracegirdle’s Figure 1). Would I be wrong to think that the West Antarctic ice shelves are under greater stress than previously thought? Eric I just spent about 10 minutes searching every possible way and can’t find the article. Can you give the ref? Any chance the authors can provide a larger version of their figure, properly referenced, that could be used in digital presentations by those of us who talk to the public about climate change? Why aren’t there bets on on when this will happen? Catastrophic events have long associated with gambling – and this is one of the rare sudden AGW events. Who is running the pool? I say Feb 14th just for the poetic factor. Gentlepeople, well done on nipping any controversy in the bud – as usual; though I’m left wondering if the warming trend isn’t related to a subject that i’d like to see Real Climate Address more often; The possible shut-down of The North Atlantic Conveyor – as extreme warming of the Southern Oceans, along with the plunging of Europe into a new Ice Age would be the result of this, as I’m sure you all know. I’ve also been wondering, and will now do a little investigating of the issue, whether or not the Level of Oxygen in our Atmosphere has been declining measurably; as it seems to me to be of an issue of Great Concern, now that we’ve cut down so much our Rainforests and are in danger of destroying the ability of Chloroplankton to form the Carbonate shells necessary to their existence, through Oceanic Acidulation. Even if you, at Real Climate, are too busy to address these issues; I’ll share what I can find out in a Technorati Blog posting, and – if it seems urgent enough – I’ll send you guys an E-mail as well. The paper is here, I believe. Satellite altimetry data show a strong increase in sea level in various parts of the Southern Ocean over the 1990s. In this paper, we examine the causes of the observed sea level rise in the region south of Australia, using 13 years of repeat hydrographic data from the WOCE SR3 sections, and the SURVOSTRAL XBT and surface salinity data. The hydrographic data show a poleward shift in the position of the Subtropical and the Subantarctic Fronts over the period. In the Antarctic Zone, the Antarctic Surface Water has become warmer and fresher, and the Winter Water tongue has become warmer, fresher, thinner and shallower. Increased freshening south of the Polar Front is linked to increased precipitation over the 1990s. Temperature changes over the upper 500 m account for only part of the altimetric sea level rise. The CTD sections show that the deeper layers are also warmer and slightly saltier and the observed sea level can be explained by steric expansion over the upper 2000 m. ENSO variability impacts on the northern part of the section, and a simple Sverdrup transport model shows how large-scale changes in the wind forcing, related to the Southern Annular Mode, may contribute to the deeper warming to the south. Also, isn’t Antarctic sea-ice thickness data incredibly poor? Unlike the Arctic, there is no long-term submarine record of ice thickness – but with the warming Southern Ocean, it seems likely that that has been going on as well. Not that it isn’t a good paper that shows the temperature trends, but it’s important (as the postscript admits) that future predictions will depend heavily on getting the ocean component right. It is encouraging that the coupled ocean-atmosphere GCMs give similar results to the data analysis, though. It’s hard to make a lot of sense out of “previously thought” because the “old thought” in general was that ice sheets were fairly stagnant on decadal timescales. So it’s true that things are happening that are more interesting than what was “previously thought,” but that isn’t very meaningful. Over the last decade, there has really been a paradigm shift in the understanding and coverage/modeling of the polar areas, and how dynamic they are. I recently attended a seminar at UChicago where Michael Oppenhemier gave a talk on ice sheets and sea level rise. A recurring statement was that we have essentially no skill at modeling dynamic processes of accelerated glacier flow, and thus there is low to no predictive ability for either the collapse of ice shelfs or the effects of accelerated flow following ice shelf collapse. Eric — Thank you. Most useful. Is the same as for the Arctic, volumetric estimation of the total Sea Ice done, if that at all is of relevance when no longer land fast? Surely the Jeff Id’s of this world will be following this thread as he’s come up with these wonderful “play down” equations of global sea ice, which presently is about 600,000 km2 behind 79-00 mean. Already saw an amazing statement of “the current state is right on the 30 year mean” by S. Goddard at WotSuUp, which I interpret as 1979-2008 mean. Ostrich policy of the guys that know the glass was half filled with now vaporised red wine, but when looking from the side the red haze of the former content used, to have the ignorami believe it ain’t so. then I went to RC to see if there was a post up. Does the NYT article do a fair job covering the paper? Over 31 years, 1969 to 2000, East Antarctica cooled by 0.1 degree-C per decade. 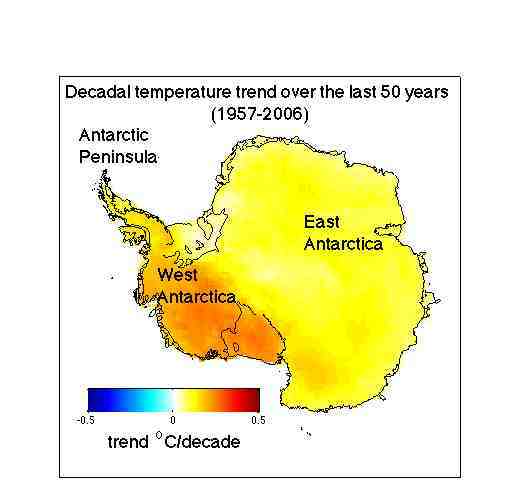 Over 50 years, 1957 to 2006, East Antarctica warmed by 0.1 degree-C per decade. to 2006 or all 0.4 degrees-C total during one of those periods). What atmospheric hypothesis can account for such behavior? hypotheses that have been mathematically entered and weighted in the GCMs. can prove, modify, or disprove any of the individual hypotheses? Gary Plyler, you’re being too precise in claiming you can isolate 12 year and 6 year trends. Did you read this part of the article above? I thought guys were supposed to prefer breakups before Valentine’s Day for financial reasons. 1) Wouldn’t it have been more instructive to have shown in Steig et al. (2009) Figure 3b the period, from say, 1969 to present, or 1979 to present, so that we could see the overall behavior in recent decades rather than from a period that ended in 2000 for the sake of comparison to an earlier study? I understand that it is important to compare your new results with previous results to show consistency, but that could have been stated, or perhaps moved into the Supplementary Material. Since, as seen in Monaghan et al. (2008), and as Chapman and Walsh (2007) drew attention to, “Trends computed using these analyses show considerable sensitivity to start and end dates with starting dates before 1965 producing overall warming and starting dates from 1966 to 1982 producing net cooling rates over the region” it would have been interesting to see if such was the case in your analysis. The results of such an analysis would help get a firmer handle on whether or not the predominance of warming in Antarctica took place from the late-1950s to the mid-1960s, or whether it occurred fairly consistently through time. A better understanding of this would help make comparisons to model expectations perhaps a bit clearer. 2) Your spatial reconstruction procedure does not seem to be pinned down by actual observations. For instance, in your Figure 3a, the observed trend at the South Pole station is given as -0.1ºC/dec while the reconstruction appears to show a positive trend there. Is this an isolated instance, or are their other observed records with show signs of trends opposite than the reconstruction produces? Your map in Figure 3a (and the cover of Nature) gives the casual reader the perception that all of Antarctica has exhibited a warming trend from 1957-2006, when in fact, it seems that at least one location, direct, local observations indicate otherwise. I understand that your procedure tried to intelligently fill in data where there was none, but in the places that actually do have data, isn’t it best to use that data? It would have been instructive to superimpose an appropriately colored dot at the location of each long-term occupied weather station representing the observed trend (in Figure 3) rather than just the two values included in 3a and 3b. 3) Why do you need reconstructions of the period of record when you have full satellite coverage? Am I correct to assume that the trend from the satellite data and the trend for the reconstructed temperatures are the same during the satellite data period? And that therefore the slightly higher trend that you all report (as compared with other efforts) comes about from cooler conditions in the pre-satellite era than has been previously determined from the direct observations? Is there an overall trend during the satellite period of record? Maybe that could have been shown in Figure 3 somewhere. Clearly Antarctica is supposed to warm in the future as greenhouse levels increase (and ozone loss decreases), but it is unclear just how it should be behaving to date. I am still scratching by head as to whether or not your results clarify that picture. The press and “skeptics” alike seem to be quite abuzz by the results (congratulations! ), but I can’t quite figure out why as your findings are not that different from what is already out there and since the models are all over the place, it is hard for the observations to support or contradict them. I recognize the hard work that went into your study, the novel methodology, and your contribution to the scientific knowledge base on the issue, but I read your results as more of a tweaking of what is known rather than a large adjustment. Wilkins ice sheet is an event. Calling it catastrophic may be a stretch. Because of the climate record is still short, more work needs to be done to determine how much of the warming results from natural climate swings and how much from the warming effects of carbon dioxide released by the burning of fossil fuels, Dr. Steig said. This is a little strange. I do believe that what is being alluded to by Dr. Steig is the role of El Nino cycles in temperature trends across the West Antarctic Peninsula, and how to go about ‘deconvolving’ the relative contributions – is that right? The article could have said that we know with certainty that natural climate cycles cannot account for the long-term temperature trends we’ve witnessed, but that these cycles do account for a great deal of year-to-year variability? That would be accurate, right? This natural cycle business has been greatly abused in the press, who continue to try and use it as an explanation for global warming, especially in the U.S.
Take the precipitation situation in the American Southwest, the African Sahel, and in other subtropical regions. Climate models predict expanding Hadley Cells as the climate warms, meaning a poleward expansion of the subtropical desert zones. What I take that to mean is that much of the American southwest will have Sonoran Desert – type climate in the future – when? Not sure. The process seems to be accelerating all across the world, though, and it seems about as robust a prediction as that of rapid polar melting. Now, we know that ocean and atmospheric temperatures have increased since the mid-century – but how has this effected the PDO? Lacking a mechanistic explanation for this time-series analysis-derived cycle, we don’t know – in fact, all the PDO is (so far) is a statistical phenomenon. The hot-button topic here is drought across the American Southwest, from California to Texas and even into Georgia. Is it due to “natural climate oscillations”, or are we seeing the predicted outcome of global warming across the region? The answer couldn’t be more important for regional water managers – planning for a “return to normal conditions as the cycles progress” could be the most disastrous plan ever – but if you read the press, you won’t find any coverage of it. Despite the importance of the issue, there has been a media blackout on the dozens of scientific studies that point to increased drought across the southwest – for example, see the Jan 2 NYT article by Felicity Barringer, which carefully avoids mention of global warming links. Funny thing, tho… the La Nina prediction is still very questionable, with most models NOT predicting a La Nina, according to the Australians: http://www.bom.gov.au/climate/enso/ In fact, we’re still outside the window of reliable ENSO predictability – not that any press articles mentioned that. NOAA says we are in a La Nina cycle, even though the start is unusually late – but their forecast discussion is very if-maybe, not as presented by the press. The U.S. press is either woefully ignorant of the state of the science, or is deliberately trying to find explanations for various regional weather and climate changes that don’t involve any mention of “global warming” – and that approach relies on the “natural cycle” argument. By the way, the award for least honest website goes to icecap.us – they’re still promoting the instrumentally flawed Lyman et. al study that showed cooling of the world oceans on their front page. the Antarctic has been warming up for the last 12k-yr. I concede the article talked about Ozone. Is that modeled in the GCMs if it is so important? If it is included in any of the 19 GCMs, how heavily is that equation weighted in the overall scheme of mathematically represented hypotheses in the GCMs? Is there a way to validate the results and thus use a scientific method to validate individual hypotheses that make up the GCMs? Though not directly related to this particular thread, I do have reason to write for something very much about Antarctica. I have completed a book, called Our Flooded World, looking at the possible progression of effects that would happen if all ice sheets gradually disappeared through melting. I used Realclimate.org extensively for all aspects of the climate science. I did not take a stand on sea level rise rates, other than positing that it is most likely that there will indeed be a one meter rise by 2100. However I did look at what would happen after that in relative, rather than absolute time, by featuring not only changes in geography, but in chapter by chapter fashion looking at trends in human population, agriculture, coastal city infrastructure (all those buried wires! ), global transportation infrastructure, the effects of sea level rise on sea level toxic waste dumps (there are many) and the posited future of the further industrialization of China and India, which is to be largely (80% by some estimates) to be coal powered. The assumption is that emissions will not be capped even at 450, but that we hit 1000 ppm sooner or later. The book will be sort of a wet Christmas Carol, by Dickens: the Ghost of Flooding Future is meant to serve as warning, although I am sure that I will be preaching to the choir. So – I have surely made errors, and hope that someone might review even a chapter of the book. That need is acute, in fact. Today, National Geographic approved a television adaptation of the book as a major special, with a major budget to portray cities gradually being inundated by either storm surge, or eventual sea level rise. It begins with sea level rises of the far and nearer past, something I know something about, and then moves to the current day changes, something I know little about. I told them that the RealClimate honchos would be needed on camera. Here is a chance for this community to have its voice heard – through content. There is still plenty of time – the book is planned for November, and copy editing will continue right up to July. The TV special (or series – a lot to present in 90 minutes) will film this summer as well in all probability. Yes. Best of luck to you. Eric great work. I look forward to more research on the changing heat balance of the WAIS. I am surprised at how consistent and widespread the warming is across much of WAIS. I am particularly concerned with the warming over the Pine Island and Thwaites Glacier, the week underbelly of the WAIS according to Hughes and Thomas. That is because they are the only main outlet glaciers of WAIS not buttressed by very large ice shelves. They are under the A in West Antarctica in the first figure. Peter send the chapters on ice sheets and melting my way and I will go over them promptly. Oh dear. Cities change rather fast, what are they going to do to imagine what the cities will look like by then? Peter, is your material on-line somewhere? Were you able to find much material on the effect of SLR on estuary productivity? Several years ago I saw a paper on this (maybe just an abstract) but wasn’t able to locate it (or any related work) again. IIRC the idea was that productivity is greatly reduced if SLR is fast enough, and that human civilization was held back until sea level stabilized enough for productivity to recover. Amd of course thanks for your efforts. So should I sell my beach house (hypothetically, I don’t own one)? I just remember winters in McMurdo Station during 1989 1990 and 1991. Nothing like seeing 6″ water lines freeze in a mater of hours. D8 Cat frames break due to cold fatigue, building pylons warp and break… The list goes on. 40 degrees below zero (C or F, same thing) is still cold enough to freeze human flesh and jet fuel. Summers do get balmy there. That is due to our activities of clearing snow, blasting rock, and in general making a mess. But the winters are still brutal, and even worse at Vostock or Amundsen-Scott. Palmer always seemed like a planned (but never realized) vacation to the tropics. The Antarctic Peninsula does not strike me as indicative of warming trends. Seems odd to think of ancient tropical plants and animals living where nothing can survive today. Seems Mother Nature just wants to try to clean up the mess that Humans have made of her planet. Lets just see what the next 8 months bring to a continent that we are destroying along with the rest of Earth. Let me please try another way to express why I am not wow’ed by the research (data teasing). The average annual temperature at Plateau Station in central East Antarctica is -57 Centigrade (according to my National Geographic Atlas of the World, 7th Edition). Is +0.1 degree Centigrade per decade of any significance? Probably not. Gary Plyler, it sounds like you’re trying to ask “tough” if not “trick” questions but they come from one of the “skeptic” blog sites, not from your own reading. Just guessing from the phrasing. Recommendation: ask questions about what you read, after you’ve read the science as published. Would be great to see an approximation of the change per decade – obviously it’s a completely different trend from the 70s to the 90s than for the whole five decades, would be interesting to see how different. Would any of your findings put these made on the back of an envelope calculations for Antarctica’s contribution to SLR in doubt? > You might wish ..
Mud wrestling invitation, eschew. Oh, my eyes. It’s the Hawaiian Syndrome: The hot spot hypothesis. I’d be interested on your comments on the quality of the AWS records. Take for example the station at Butler Island that you report has a warming trend of 0.45 degrees C per decade. GISS data shows net cooling over the record period (WTF!). But given the paucity of data points any trend appears optimistic. If you examine the station history through the University of Wisconson website there appears to be a long record of malfunctions and changes in site including changes in elevation of over 100m. The station appears to have been buried by snow a number of times. Station Elaine on the Ross Ice shelf is similarly affected. How do the problems with the AWS network affect your results? How much time was spent vetting the reliability of the AWS records? Did you accoutn for this in your analysis? Given their unreliability I am wondering why you bothered using AWS at all. 21 Peter Ward: RE your other book, “Under a Green Sky”, how do you know the sulfur came from the ocean rather than from volcanoes? The oceanographers don’t seem to be impressed. I was impressed/scared. I see that sulfur has 7 isotopes and I guess that that is how you decided. 5 James Staples: I am concerned about the O2 partial pressure because I am asthmatic. I have heard that in some cases, a small change in O2 partial pressure makes a difference in asthma attacks. Dr. Steig: “To read this story in full you will need to login or make a payment (see right).” I can’t read your article without going to a library that subscribes to Nature. Could you post all of it on RealClimate later? Problem with the NASA web site: My computer is too old to run Java. Any possibility that Solar Dimming of the Eastern Antarctic could account for the temperature differential between the 2 halves? Re #31 response: I see that there is a GISS co-author (Drew Shindell), which means that the extremely efficient staff there has already posted a copy (at the end of the GISS press release here). For those wondering about copyright, bear in mind whose copyright law it is and that Nature receives a sweet deal on postage from another division of that same entity. This is something that all U.S. government scientific agencies can do, although many don’t bother at all and only two that I know of (GISS and GFDL) do it systematically. Just checking – are the trends shown above convergent or divergent? according to the models as well? On many occasions on this site it’s been said that cooling in Antartica is consistent with AGW, as the models show etc…. Now it appears that a warming Antarctica is also consistent with AGW. I am curious to know, is there any kind of change in temperature down there which would invalidate the AGW thesis? Per the map legends, is that 0.25 degrees in 50 years? GHG or Ozone depletion though I guess is the question or a bit or ratio of both. This also beings in the recent change of direction by the skeptics who have used EAIS increased precipitation as a seemingly silly argument along with the new one I seem to find croping up on the notion of water vapour again being a GHG that is a forcing and not just a feedback. Water vapour cannot increase itself in the atmosphere can it, hence a feedback ? Only forcing agents can increase water vapour in the atmosphere by essentially adding more energy into it and hence it being able to hold more of it. I doubt that the evaporation rates incrwase, the atmosphere just holds it longer ? Fine work. I think you must calculate this extra warmth found into the global whole, or how? How much do your findings rise the global warming during the last 50 years? North, G.R. and Coakley, J.A. 1979. “Differences Between Seasonal and Mean Annual Energy Balance Model Calculations of Climate and Climate Sensitivity.” J. Atmos. Sci., 36, 1189-1204.